You may have heard that CERN announced the discovery of a strange particle known as Z(4430). A paper summarizing the results has been published on the physics arxiv, which is a repository for preprint (not yet peer reviewed) physics papers. The new particle is about 4 times more massive than a proton, has a negative charge, and appears to be a theoretical particle known as a tetraquark. The results are still young, but if this discovery holds up it could have implications for our understanding of neutron stars. 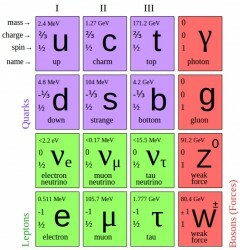 A periodic table of elementary particles. The building blocks of matter are made of leptons (such as the electron and neutrinos) and quarks (which make up protons, neutrons, and other particles). Quarks are very different from other particles in that they have an electric charge that is 1/3 or 2/3 that of the electron and proton. They also possess a different kind of “charge” known as color. Just as electric charges interact through an electromagnetic force, color charges interact through the strong nuclear force. It is the color charge of quarks that works to hold the nuclei of atoms together. Color charge is much more complex than electric charge. With electric charge there is simply positive (+) and its opposite, negative (-). With color, there are three types (red, green, and blue) and their opposites (anti-red, anti-green, and anti-blue). 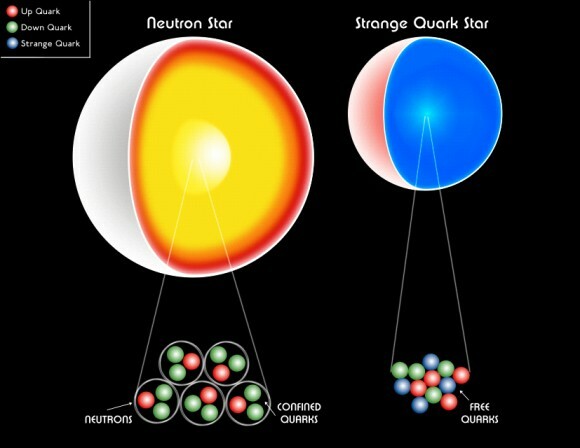 Because of the way the strong force works, we can never observe a free quark. The strong force requires that quarks always group together to form a particle that is color neutral. For example, a proton consists of three quarks (two up and one down), where each quark is a different color. With visible light, adding red, green and blue light gives you white light, which is colorless. In the same way, combining a red, green and blue quark gives you a particle which is color neutral. This similarity to the color properties of light is why quark charge is named after colors. Combining a quark of each color into groups of three is one way to create a color neutral particle, and these are known as baryons. Protons and neutrons are the most common baryons. Another way to combine quarks is to pair a quark of a particular color with a quark of its anti-color. For example, a green quark and an anti-green quark could combine to form a color neutral particle. These two-quark particles are known as mesons, and were first discovered in 1947. For example, the positively charged pion consists of an up quark and an antiparticle down quark. Under the rules of the strong force, there are other ways quarks could combine to form a neutral particle. One of these, the tetraquark, combines four quarks, where two particles have a particular color and the other two have the corresponding anti-colors. Others, such as the pentaquark (3 colors + a color anti-color pair) and the hexaquark (3 colors + 3 anti-colors) have been proposed. But so far all of these have been hypothetical. While such particles would be color neutral, it is also possible that they aren’t stable and would simply decay into baryons and mesons. There has been some experimental hints of tetraquarks, but this latest result is the strongest evidence of 4 quarks forming a color neutral particle. This means that quarks can combine in much more complex ways than we originally expected, and this has implications for the internal structure of neutron stars. Very simply, the traditional model of a neutron star is that it is made of neutrons. Neutrons consist of three quarks (two down and one up), but it is generally thought that particle interactions within a neutron star are interactions between neutrons. With the existence of tetraquarks, it is possible for neutrons within the core to interact strongly enough to create tetraquarks. This could even lead to the production of pentaquarks and hexaquarks, or even that quarks could interact individually without being bound into color neutral particles. This would produce a hypothetical object known as a quark star. This is all hypothetical at this point, but verified evidence of tetraquarks will force astrophysicists to reexamine some the assumptions we have about the interiors of neutron stars. Neutron stars are extraordinary objects in the universe. 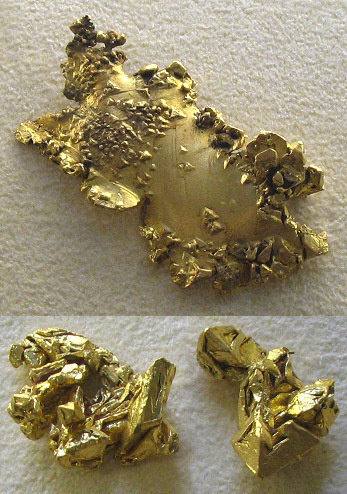 Their density is so high that atoms melt within them and new states of matter arise. 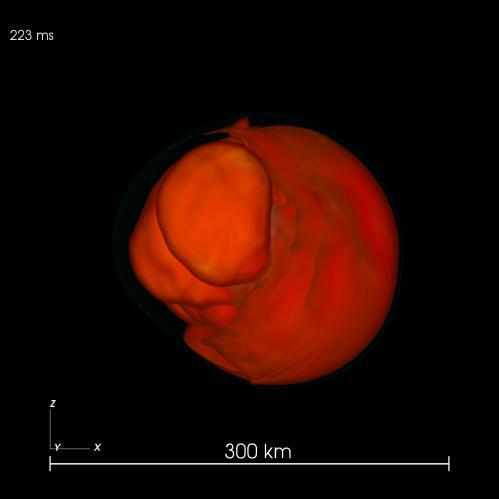 Tetyana Galatyuk and her colleagues try to simulate these conditions at the smallest scale using the FAIR particle accelerator and observe the results with the CBM detector. Thus, they not only learn more about neutron stars, but also about the innermost structure of matter. Tetyana Galatyuk is head of a junior research group at GSI Helmholtz and the TU Darmstadt. With her group, she carries out experiments using HADES and CBM to explore compressed nuclear matter. Galatyuk studied physics in Ukraine, worked with the STAR detector at the RHIC accelerator facility in the U.S. and subsequently conducted research in Germany. “For this purpose we used nearly 16,000 processor cores in parallel mode, but still a single model run took about 4.5 months of continuous computing”, says PhD student Florian Hanke, who performed the simulations. Only two computing centers in Europe were able to provide sufficiently powerful machines for such long periods of time, namely CURIE at Très Grand Centre de calcul (TGCC) du CEA near Paris (Fig. 1a) and SuperMUC at the Leibniz-Rechenzentrum (LRZ) in Munich/Garching (Fig. 1b). 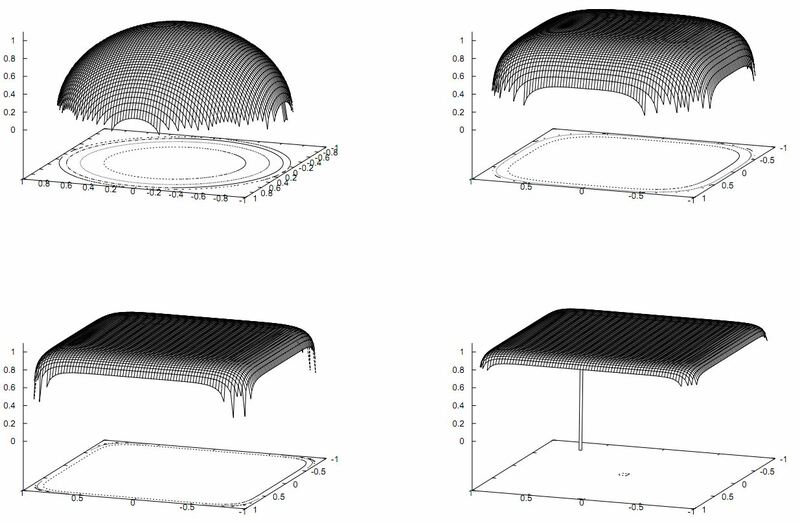 Many Terabytes of simulation data (1 Terabyte are thousand billion bytes) had to be analysed and visualized before the researchers could grasp the essence of their model runs. What they saw caused excitement as well as astonishment. The stellar gas did not only exhibit the violent bubbling and seething with the characteristic rising mushroom-like plumes driven by neutrino heating in close similarity to what can be observed in boiling water. (This process is called convection.) The scientists also found powerful, large sloshing motions, which temporarily switch over to rapid, strong rotational motions (Fig. 2, movie). Such a behavior had been known before and had been named “Standing Accretion Shock Instability”, or SASI. This term expresses the fact that the initial sphericity of the supernova shock wave is spontaneously broken, because the shock develops large-amplitude, pulsating asymmetries by the oscillatory growth of initially small, random seed perturbations. So far, however, this had been found only in simplified and incomplete model simulations…..
Astronomers using NASA’s Swift X-ray Telescope have observed a spinning neutron star suddenly slowing down, yielding clues they can use to understand these extremely dense objects. A neutron star is the crushed core of a massive star that ran out of fuel, collapsed under its own weight, and exploded as a supernova. A neutron star can spin as fast as 43,000 times per minute and boast a magnetic field a trillion times stronger than Earth’s. 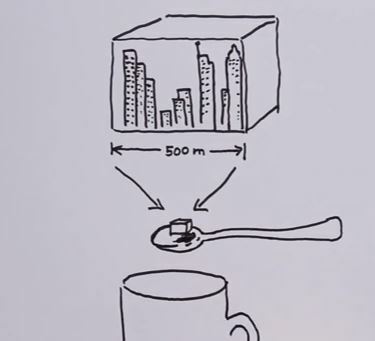 Matter within a neutron star is so dense a teaspoonful would weigh about a billion tons on Earth. 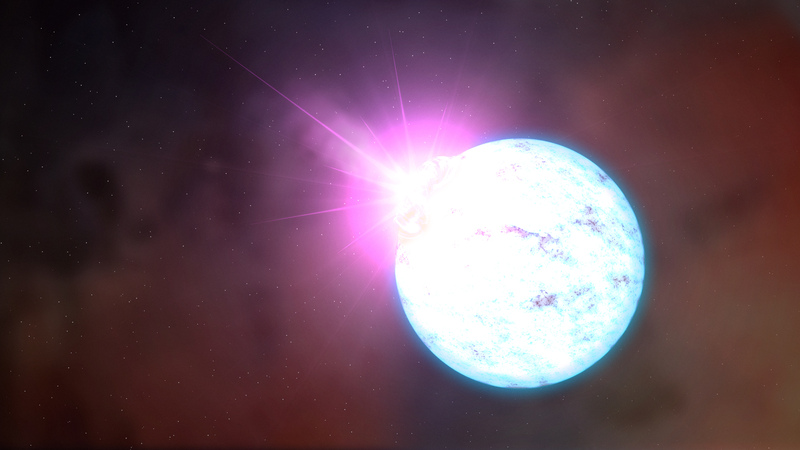 An artist’s rendering of an outburst on an ultra-magnetic neutron star, also called a magnetar. Observations of X-ray pulses from 1E 2259+586 from July 2011 through mid-April 2012 indicated the magnetar’s rotation was gradually slowing from once every seven seconds, or about eight revolutions per minute. On April 28, 2012, data showed the spin rate had decreased abruptly, by 2.2 millionths of a second, and the magnetar was spinning down at a faster rate…..
Trial wavefunction that interpolates between sphere (for N = 2), and cube (as N → ∞) for N = 2, 4, 8, 12. Inside atomic nuclei, protons and neutrons fill space with a packing density of 0.74, meaning that only 26 percent of the volume of the nucleus in is empty. That’s pretty efficient packing. Neutrons achieve a similar density inside neutron stars, where the force holding neutrons together is the only thing that prevents gravity from crushing the star into a black hole. Today, Felipe Llanes-Estrada at the Technical University of Munich in Germany and Gaspar Moreno Navarro at Complutense University in Madrid, Spain, say neutrons can do even better. These guys have calculated that under intense pressure, neutrons can switch from a spherical symmetry to a cubic one. And when that happens, neutrons pack like cubes into crystals with a packing density that approaches 100%. Anyone wondering where such a form of matter might exist would naturally think if the centre of neutron stars. But there’s a problem. On the one hand, most neutron stars have a mass about 1.4 times that of the Sun, which is too small to generate the required pressures for cubic neutrons. On the other, stars much bigger than two solar masses collapse to form black holes. That doesn’t leave much of a mass range in which cubic neutrons can form. As luck would have it, however, last year astronomers discovered in the constellation of Scorpius the most massive neutron star ever seen. This object, called PSR J1614-2230, has a mass 1.97 times that of the Sun. That’s about as large as theory allows (in fact its mere existence rules out various theories about the behaviour of mass at high densities). But PSR J1614-2230 is massive enough to allow the existence of cubic neutrons. Astrophysicists will be rubbing their hands at the prospect. The change from spherical to cubic neutrons should have a big influence on the behaviour a neutron star. It would change the star’s density, it’s stiffness and its rate of rotation, among other things. So astronomers will be getting their lens cloths out and polishing furiously in the hope of observing this entirely new form of matter in the distant reaches of the galaxy.